If you steal food, if you’re hiding and eating, your hands will get a mouth. This painting on this ladle shows a red hand with a mouth hole in its palm, rimmed with sharp teeth. It may be a reminder that a thief’s hands will eat stolen food before he can put it in his mouth. Or the design may represent itqiirpak, a legendary sea creature that grabbed noisy boys from the men’s house. Virginia Minock: Ipuun [ladle]. They’re still being used nowadays but not as fancy. John Phillip, Sr.: Angassanek wangkuta pilaqait wangkut nunamteni. Neva Rivers: Tauna-gguq arulamiruksuarlua-ll’. Imkut flat-alrianeng pilget arulamirutmeng piaqaat. Imna-llu ipuuksuaraq. Soup-aliiluki pitukeput. Soup-alilriameng piaqata pilutuluki. (That is a small arulamirun [ladle]. Those ones that are flat are called arulamirun. John Phillip, Sr.: Yaassiigenqellriit taukut arulamirutneng. Neva Rivers: Yaassigenqeggluki ilait takluteng. John Phillip, Sr.: Ii-i, takurluteng. Joan Hamilton: And what you call them also depends on the length. John Phillip, Sr.: Ii-i, iliini amllermeng ilungqerpegnateng. Suzi Jones: And are they always painted a little bit with the red? Neva Rivers: Everything has to painted, not to leave it like this [plain]. They have to paint them all the time with the red and black. Neva Rivers: Design-arluki kenekluki pituit. Joan Hamilton: Because they treasure them and value them. Neva Rivers: We all have red clay. This [red coloring] is from the clay, what they made it from. They make sure they put oil on it, so it [color] will stay longer. Virginia Minock: And it won’t crack. Neva Rivers: And it doesn’t wash off. It will be reddish all the time. They never leave it like this, pale all the way. And they have to put fancy [designs] in here [bowl], just to make it look pretty, for decoration. Un’ maa-i quletmun qaralingqerrluni (there are decorations going upwards (on handle)]. Neva Rivers: Qaraliuciqait. Qaralilituut makuneng to make it look pretty. John Phillip, Sr.: Pinrilengraata qaralililarait piullermegneng iliit. Joan Hamilton: Sometimes the decoration is just for aesthetics, personal preference, not necessarily with a story. Neva Rivers: You just make a design. Not to leave it [the meaning] clear all the time. Virginia Minock: Una-qaa unatnguaruuq qanerluni? Nauga qanemcilalriit teglegyukuvet unateten qanengciqut. John Phillip, Sr.:Ii-i, pillilria-wa. Qanemcitangqertuq. Tua-r’ tang taungulrua wani-wa. Qanruaruluni. Virginia Minock: Yes. If you steal food, if you’re hiding and eating, your hands will get a mouth, and you wouldn’t be able to eat because your hands will eat it by the time you take it. I guess that’s that story right here. It’s a hand with a mouth. Joan Hamilton: Ciin tua tuavet ellillrua? Virginia Minock: Tua-i-w’ neqakesqelluku tamana pillikii. Virginia Minock: So you’ll remember the story when you see it. Joan Hamilton: We have different physical evidence of stories. Neva Rivers: Itqiirpiim unatai taugaam qanerqertut. 1. An arulamirun is a “long-handled ladle” (Fienup-Rirodan 2005). 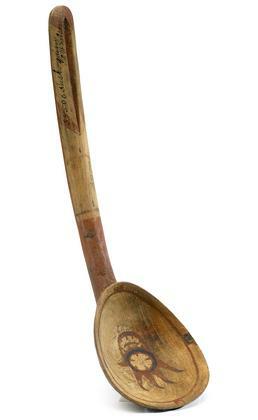 It is also a “ladle” in the Hooper-Bay Chevak dialect of Yup’ik, which is from the root arulamirte- “to stir; to use a ladle” (Jacobson 1984). 2. Itqiirpak is a “legendary big hand from the ocean with a mouth on each fingertip and a big mouth on the palm” (Jacobson 1984).